Lobster Fra Diavolo is a simple and elegant lobster pasta recipe. It feels like a special occasion pasta, but it’s easy enough for whenever you feel like it. It’s the perfect way to stretch a small amount of lobster. Click here to pin this Lobster Fra Diavolo now! I remember when lobster used to be the big treat on a restaurants menu. You had two fancy choices, steak or lobster. There was no quinoa crusted salmon over a lentil avocado salad or grilled radicchio topped with a maple bourbon bacon fried trout. There was steak and lobster and if it was a fancy Italian place you could also get veal Parmesan. So, yeah, times have changed. I can’t remember the last time I ordered lobster in a restaurant. However, lobster still feels fancy to me, perhaps because I will probably never cook a live lobster in my kitchen. I will however, by those tiny already cooked lobster tails when they are on sale. I went looking for a recipe that used cooked lobster and not a lot of it. I found this Lobster Fra Diavolo in Giada’s Everyday Pasta. It called for two cooked lobster tails. Now, I’m sure her lobster tails were the normal size, not the teeny tiny ones that I got. But you know what? Even with my tiny amount of lobster this was good. It felt special and I loved how easy it was! This recipe goes together really quickly once you get started, so it is important to have your ingredients ready. Step 1 – Start a pot of water to boil, cook the pasta per directions and drain, reserving 1/2 cup of the pasta water. Step 2 – While the pasta is cooking – finely chop the onion, garlic. Cube the lobster meat and chop the parsley and basil. Step 3 – Heat the oil in a skillet and cook the onion for about 4 minutes. Step 4 – Add the garlic, red pepper flakes, salt, pepper and oregano and cook for about a minute. Step 5 – Add the cognac and stir scraping up any browned bits. Step 6 – Add the tomatoes, lobster, parsley and basil and cook until heated through. Step 7 – Add the pasta to the sauce. Add a little pasta water if it is too dry. Note – this pasta is very subtly dressed it is not heavily sauced. My lobster tails were very small, but even with that small amount, it was excellent and tasted decadent. 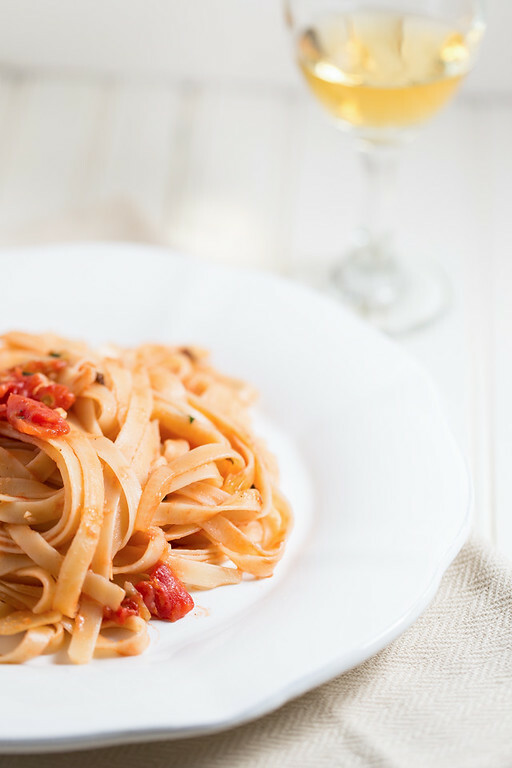 You’ll turn to this delicious lobster pasta recipe time and time again for special occasions or just days that you need to feel a little pampered. This is a great way to make a two lobster tails stretch to feed four. Even with the small amount of lobster, it still tastes decadent! Cook the pasta in a large pot of boiling water per directions and drain, reserving 1/2 cup of pasta water. Meanwhile, heat the olive oil in a large, heavy skillet over medium-high heat. Add the onion and cook for about 4 minutes. Then add the garlic, red pepper, flakes, salt, pepper, and oregano. Stir together and cook for about 1 minute. Add the cognac and scrape up any brown bits. Add the tomatoes, lobster, parsley and chopped basil. Cook, stirring, until is is heated through. Add the linguine to the pot and stir to combine it with the sauce. If the sauce is too dry, stir in a little of the reserved pasta sauce. Serve and top each serving with a lobster claw (if you have it) and a basil sprig. Note - this is a relatively dry pasta sauce. You can save a little of the pasta water if you want to make it a little more moist. This pasta dish looks fantastic! 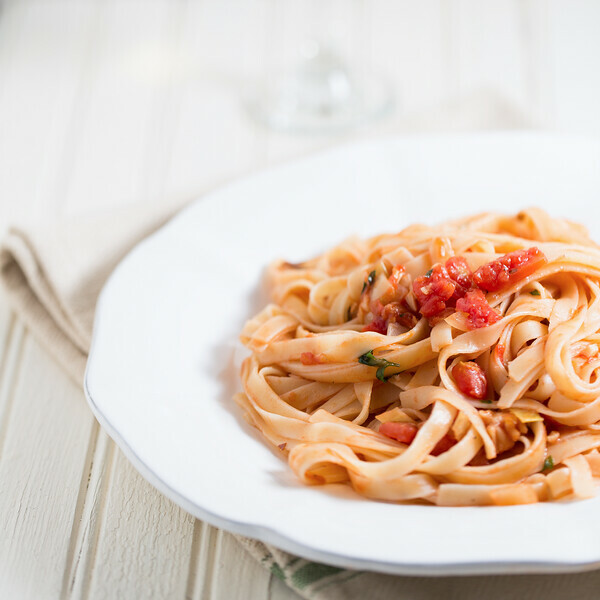 Lobster is such a delicious choice for pasta….yum! I live near the coast in New England where lobsters are plentiful. This sounds like a super way to serve the meat. I’ve really been into spiralized veggie noodles so I’ll try it with those rather than pasta. Can’t wait to try! Simply perfection! I grew up spending my summers in Maine, so fresh lobster is close to my heart. Loving that you’ve added it with a spicy tomato sauce…yummo! When I was little, I remember going to the Jersey shore and having lobster. What a treat it was. Your linguine would be a treat too. I love the spice with the sweet lobster. Lobster? I can take it or leave it. It would work equally as well with our nice big king, tiger or banana prawns. Fancy restaurant dish from my youth – Chicken in a Basket. My family couldn’t afford the the upmarket steak and lobster places. It looks wonderful! I love lobster, but hate playing with the whole lobsters. Something about my food looking at me gives me the heeby-jeebies. Those old-time Italian-American dishes can really be good. Last night I had veal with lemon, capers, and artichokes. Others at the table had a veal and lobster dish in a creamy sauce. You are so right: lobster is still a treat! It is funny how the food world has changed! But I’m pretty happy to have more options other than just steak and lobster. This is such a fun pasta!